This is Sneakers, age 18 years 7 months, sleeping on (or next to) Within the Sanctuary of Wings. The dragon bedspread is from Full Moon Loom, btw. 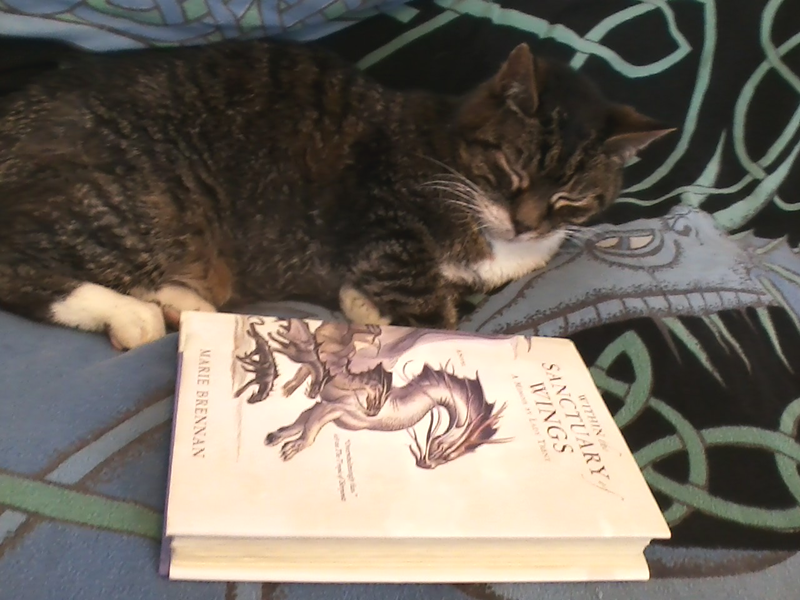 The picture of him with The Silmarillion is from April 2008, when he was much younger and much larger, but clearly ahead of his time when it comes to sleeping on or near SFF. Sneakers has been fading for a while and we really thought he had reached the end of the line last week, we were getting ready to make The Call. But he’s now on appetite-stimulating medication, is eating (etc.) again, and definitely acting like there’s life in the old boy yet. He’s a self-rescue who turned up at our door in December 1999 aged about 10 weeks (so-called humans used to dump pets in the fields next to our house), saying “Bastet sent me”. I’m allergic to some cats, but not him. This entry was posted in Cats Sleep on SFF and tagged Doctor Science, J.R.R. Tolkien, Marie Brennan by Mike Glyer. Bookmark the permalink. Glad to hear Sneakers is feeling better! What a lovely story, Doctor Science. I hope that Sneakers graces your lives, in good health and spirits, for a while yet. 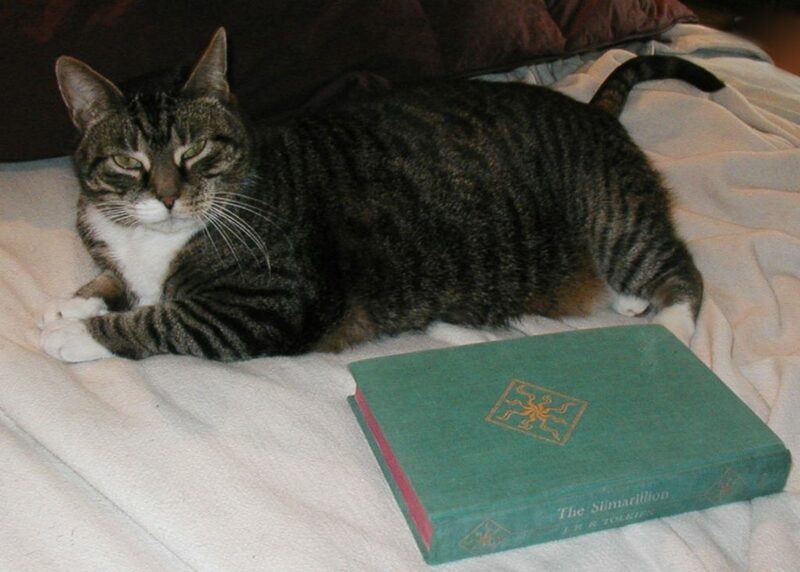 Sneakers is clearly a gentleman of excellent taste, in books and in humans. Those appetite stimulants work wonders. We keep some on hand for our gato who’s about a year younger than Mr. S.
Lucky cat, and lucky you to enjoy his company for so long! My Shadow was just shy of 20 when he finally told me it was time. And he’d had kidney disease and other chronic stuff for years. I hope Sneakers will revive and have a lot more happy time with you. Also, I love the term “self-rescue”. And “Bastet sent me”.